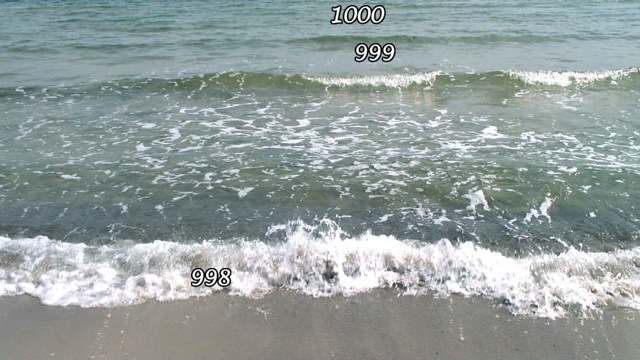 1000Waves by the Japanese artist duo Mai Yamashita and Naoto Kobayashi is a 50-minute long, single take video registration of a calm sea. The makers counted and numbered every single wave that washed ashore, resulting in a seemingly endless flow of waves and floating numbers, until it gradually adds up to 1000. Yamashita and Kobayashi became well-known for their work Infinity (2006), in which they also explore a repetitive process. For five consecutive days, they ran in the same loop on a grass lawn. Slowly, their actions carved out a path in the pattern of an infinity loop (∞). As a viewer, one’s gaze continuously shifts in and out of focus. Watching the waves, watching the numbers, eagerly waiting for the next one to pop up, following that one until it washes ashore, and on and on and on… Similar to counting sheep before falling asleep, the steady rhythm of the waves rock us back and forth, in and out of consciousness. While Yamashita and Kobayashi attempt to capture and organize infinity by giving us a glimpse of its boundaries, we lose track of time, we lose ourselves.